I have 63 weeks to go until my wedding, a to-do list that is slowly becoming a ‘to-do’ book and a ridiculously tiny budget to work with, so i’ll happily take up any opportunity to use my love of crafts to save money and personalise my big day. I picked up a copy of Mollie Makes: Weddings (RRP £11.99) at the library yesterday, this small (96 pages) hardback book is full of inspirational ways to add homemade touches to your big day. The book features a short introduction from editor, Lara Watson, and is followed with a collection of 20 unique and inspiring ideas taken from various Mollie Makes design-makers. I like how each page gives a bit of background on each crafter and has links to their individual websites which contain even more ideas. Every project is broken down into simple steps and surrounded by beautiful detailed photos which allow for beginners to try their hand at a number of different techniques, such as crocheting, glass painting and clay modelling. The book features projects such as Clare Young’s save the date garland, Emma Lyth’s button stem bridal bouquet and Ilaria Chiaratti’s carved heart table centrepiece. Other projects include how to make lace embossed favours, cake toppers, applique photo album cover and cut and print wedding invites. The books pages are lined with floral pastel designs giving its artwork, photography and overall look a pretty vintage feel to it, making it a lovely addition to my bookshelf. The book is great value for money although I wish it contained more content than it does! The Mollie Makes website has hundreds of similar ideas that can be used in conjunction with the book. 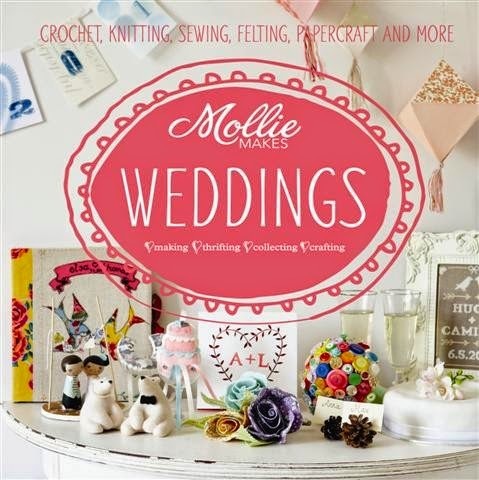 The wedding volume is just one in a collection of Mollie Makes crafting books available on Amazon. I definitely have my eye on Mollie Makes: Christmas and Woodland Friends! Using the ideas from this book will definitely save you money and allow for advanced preparations to be made, to take the stress off the months leading up to the big day. I’m now away to try my hand at making clay embossed tags and read my next book on my ever growing list; Kirstie Allsopp’s Craft. "Recipe | Caramelised Red Onion Chutney"